A groundbreaking idea for a business – one that could benefit University of Virginia student-athletes and members of the Charlottesville community alike – hinged on NCAA approval. UVA students Grant Sirlin and Jared Vishno were confident they would get it. In their proposal, they believed they had taken into consideration all of the NCAA’s bylaws and addressed every potential pitfall. But until they received a “yes” in writing, all Sirlin and Vishno had was an idea. In February of 2017, they heard back from the NCAA. “It was literally one line saying, ‘Based on the business model that you have created, it is permissible for student-athletes to make money using your service,’” Sirlin said. Sirlin and Vishno, a pair of UVA third-year students who have known each other since they were 6 months old, have devised a way for college student-athletes – with the NCAA’s blessing – to earn money. 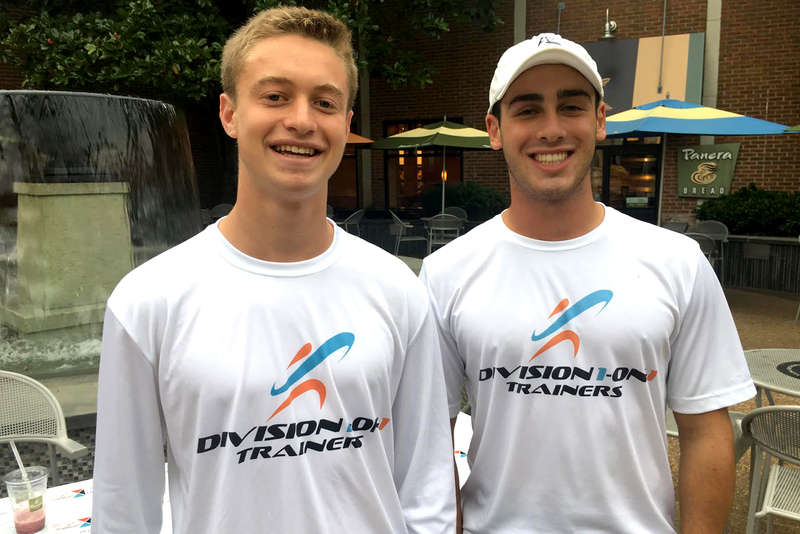 The duo’s company, Division 1-on-1 Trainers, pairs UVA student-athletes with athletes in the Charlottesville community for personal training lessons. Typically, clients range in age from 8 to 18, with all skill levels welcome. Currently, D1on1 has 38 male and female student-athletes from 16 sports serving as trainers – including football, basketball, soccer, baseball, lacrosse and tennis players. Together, they have given more than 150 lessons. Working as independent contractors, the trainers set their own prices; the average one-hour, one-on-one session costs $40, with group sessions also available. So how, exactly, is the company – which has won $11,000 competing in UVA’s Entrepreneurship Cup over the last two years – able to do this? Sirlin and Vishno grew up playing sports together in Westport, Connecticut, with their dads often serving as their coaches. Eventually, the pair began coaching and training kids themselves. “It led us to believe that sports are a means for personal growth,” Vishno said. When the friends arrived on Grounds, they said they noticed a “gap” between UVA student-athletes and members of the Charlottesville community. Other than watching the athletes play in games and getting occasional autographs, community members didn’t have much meaningful interaction with the players they were cheering on. “We wanted to bridge the gap,” Vishno said. Just a few months into their time at UVA, Sirlin (an economics major) and Vishno (a Spanish major) hatched their plan. “We realized that there was an opportunity to help college athletes make money, while also providing a service that could benefit a lot of young athletes in the Charlottesville community,” Vishno said. But with myriad NCAA rules pertaining to student-athlete eligibility, accomplishing it was easier said than done. That’s where Eric Baumgartner, UVA’s associate athletics director for compliance, came in. Sirlin and Vishno said they leaned on Baumgartner throughout the process. One of the big things Sirlin and Vishno learned was that they weren’t allowed to use the names or images of the student-athletes to promote their business. To that end, clients who use D1on1 don’t know which UVA player will be giving them their lesson until they have booked their session. They only get to choose the sport and the things they want to work on. Sirlin and Vishno take it from there. For every session that takes place, the student-athlete must complete a form that is signed by their coach and a UVA compliance officer. “Everybody is in the loop to make sure everything is within the regulations and there are no issues,” Vishno said. So how much money do Sirlin and Vishno make from the venture? Sirlin and Vishno take great satisfaction in being able to help student-athletes make extra money. Former soccer player Edward Opoku (now a member of Major League Soccer’s Columbus Crew) and former baseball player Caleb Knight (now in the Chicago Cubs organization) both served as D1on1 trainers while at UVA. Opoku used to send his earnings to family members in Ghana, though he said his D1on1 experience wasn’t just about making money. This year, Sirlin and Vishno are hoping to expand the business to other universities in the state. Their long-term goal is to go nationwide. Sirlin and Vishno believe the beauty of the training sessions is that the client athletes can be of any skill level and can have the sessions tailored however they want. Sirlin said that in the two-plus years they have been working on their business, they haven’t come across any others like theirs.